T. Boone Pickens, the oilman and clean-energy booster, shelved his massive wind-power project in Texas even as he stepped up his push to increase the use of natural gas for transportation. Cheap natural gas, the lack of electricity-transmission lines and the lingering credit crunch have combined to take the shine off large-scale renewable-energy projects, and those factors led Mr. Pickens to halve his $2 billion wind-turbine order with General Electric Co., said a spokesman for Mr. Pickens's Mesa Power LP. Mr. Pickens in May 2008 announced plans for the biggest wind farm in the U.S., by amount of installed megawatts, to be located in the Texas panhandle. But Tuesday he said he would cut his order with GE to 333 turbines from 667 machines and use them for wind farms in Canada and Minnesota. That means the Pampa Wind Farm slated for north Texas--and postponed last summer until at least 2013--won't happen under current conditions. "It's off the table," Mr. Pickens said Wednesday in a conference call. If Texas makes more investments in transmission lines to carry power from the remote wind farm to towns and cities, he said, "we'll be back." A GE spokesman said the two parties mutually renegotiated the terms of the 2008 deal. Natural-gas prices have fallen sharply since the summer of 2008, when Mr. Pickens announced the big wind farm and the "Pickens Plan," which calls for using natural gas to power big rigs, buses and other large vehicles to lessen U.S. dependence on foreign oil. Cheaper natural gas hurts wind farms, because cheaper gas makes gas-fired power plants a more attractive option for electricity generation. "You can't finance wind farms very well when natural gas is under $6" per million British thermal units, Mr. Pickens said. Natural-gas futures settled at $5.733 Wednesday afternoon on the New York Mercantile Exchange. 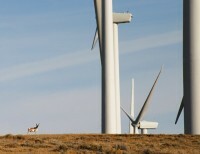 The effects of the credit crunch and the economic slowdown also slowed growth in the wider U.S. wind-power industry in 2009, after a record year for wind-power installations in 2008. But less expensive natural gas, due to a boom in U.S. production over the last two years, has given new impetus to Mr. Pickens's transport plans. Mr. Pickens announced Wednesday a new national television ad calling on America to "wake up" to the cost of importing oil. He also called on Congress to pass pending legislation that would offer new incentives for greater use of natural gas in the heavy-duty transport fleet.